Guests will enjoy a scenic drive from Yangon to Prome. Once controlled by the Mon tribe during the Bagan Era and then conquered by the Burmese King Alaungpaya in the 1754, Prome boomed along with the Irrawaddy Flotilla Company in the 1890’s and it is now an important trading post. 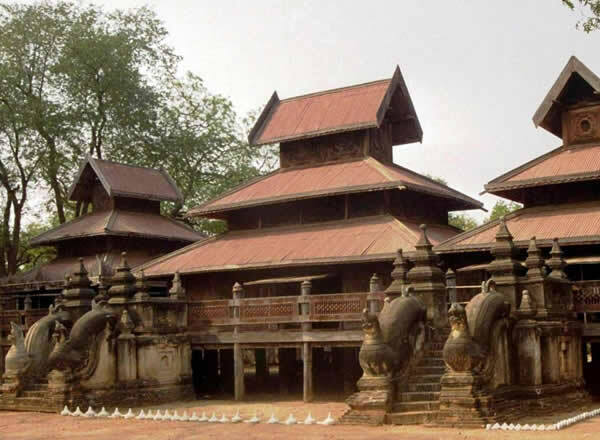 In the afternoon we drive to Thayekhittaya (also known as Sri Ksetra, the “Fabulous City” in the Pali language), an ancient Pyu city that ruled in this area between the 5thand the 9th century AD. 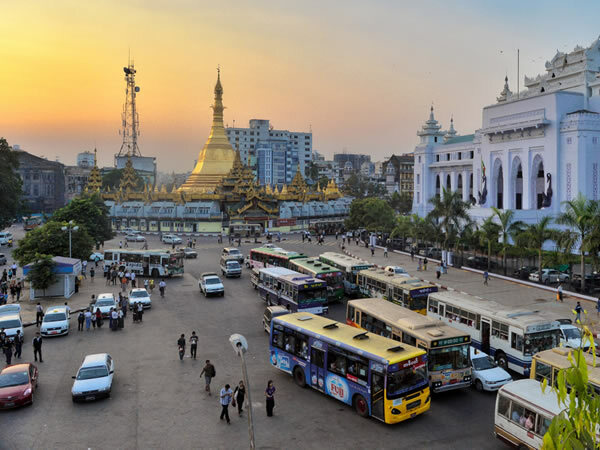 In central Prome we visit the impressive Shwesandaw Pagoda complex, one of the most important Buddhist pilgrimage sites of Myanmar, and the Wunchataung Paya (Apology Mountain Pagoda) a fabulous vantage point of the Shwesandaw Pagoda and the surrounding mountains (1:30 pm – 4:30 pm). 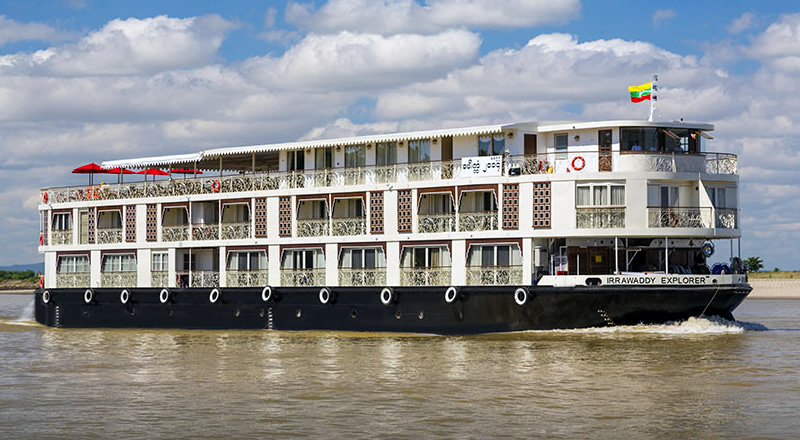 This afternoon we set sail for your exploration of the Irrawaddy River. This morning we explore the town of Thayetmyo: the oldest golf course of Myanmar with fascinating history. We then visit the local market as well as several colonial homes constructed during the British colonization of Burma. We arrive at Magwe this morning. Visit Myat Than Lun Paya, a 1929 built pagoda of gold solid bricks set on a hilltop with a beautiful panoramic vantagepoint. Back to the ship and sail the rest of the day. stupas that marked the original edges of the city and enjoy a marvelous sunset over the Bagan plains. 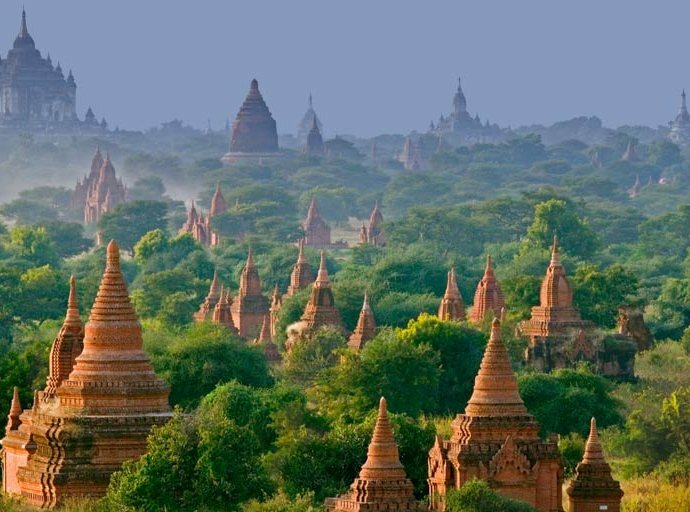 This morning enjoy a full day visit of the most significant Pagodas and Temples of the 2,000 listed around Bagan . Following lunch on board we’ll set out via local Oxcart to view the sunset atop the most significant temple in the area with a champagne toast . After Dinner, follow Puppet Show on Sun Deck. This morning we arrive at Yandabo, a picturesque village famous for its pottery, also where the peace treaty of the First Anglo-Burmese war signed on Feb. 24, 1826. We go ashore for a walk stopping at workshops to witness their craft and interesting way of firing their pottery. Following we’ll visit the local school and the monastery. Back to the ship and enjoy sailing the rest of the day. 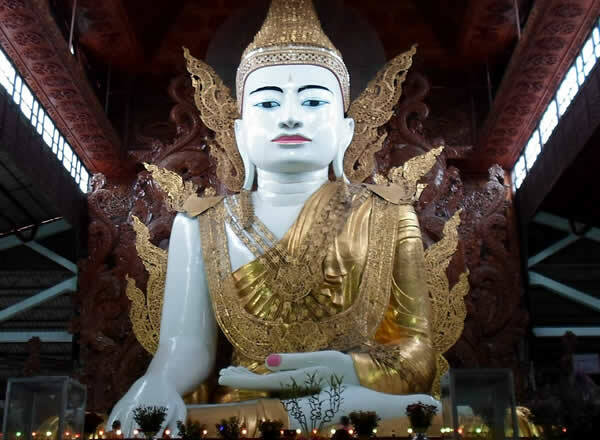 This morning we’ll depart early for Monywa to visit the Hpowindaung and Shwebadaung Caveswhere hundreds of Buddha Statues are placed inside niches decorated with wonderful mural paintings. After lunch, we visit the splendid Sambuddhai Kat Kyaw pagoda with its more than 500,000 Buddha images. We then return to the ship for time to relax before Dinner. After breakfast, disembark and visit central Mandalay: Mahamuni Pagoda and Mandalay Hillwhere spiraling staircases lead to sweeping views of the city and its temples. Nearby, we’ll visitKuthodaw Paya, which contains the world’s biggest book, the workshops of gold leaf and tapestry making, woodcarving, marble carving and bronze casting. Transfer to airport for return flight to Yangon. Upon arrival into Mandalay guests will enjoy a morning tour of Mahamuni Pagoda and Mandalay Hill where spiraling staircases lead to sweeping views of the city and its temples. Nearby we’ll visit the Kuthodaw Paya, which contains the world’s biggest book as well as a gold leaf workshop commonly used to adorn Buddha images at temples throughout Myanmar. Embark the ship at Gawein Jetty before lunch. After lunch, we then travel to Amarapura, the penultimate Burmese Royal Capital (1783) to visit U-Bein Bridge at sunset . Returning to the ship for a welcome reception and Dinner . We will sail a short distance upstream to the small town of Mingun. After breakfast, we will visit the unfinished pagoda and the largest working bell in the world. After lunch, we will explore the town ofAva by horse-cart visiting the beautiful 200 year old teak Bagaya Kyaung Monastery, Nanmyin watchtower (27mt. high) and the Me Nu Ok Kyaung monastery .Following dinner guests will enjoy adance and theatre performance on-board. where hundreds of Buddha Statues are placed inside niches decorated with wonderful mural paintings. After lunch, we visit the splendid Sambuddhai Kat Kyaw pagoda with its more than 500,000 Buddha images. We then return to the ship for time to relax before Dinner. This morning we arrive at Yandabo, a picturesque village famous for its pottery, also where the peace treaty of the First Anglo-Burmese war signed on Feb. 24, 1826. We go ashore for a walk stopping at workshops to witness their craft and interesting way of firing their pottery. Following we’ll visit the local school and the monastery. This morning enjoy a full day visit of the most significant Pagodas and Temples of the 2,000 listed around Bagan. Following lunch on board we’ll set out via local Oxcart to view the sunset atop the most significant temple in the area before returning to the ship for a sumptuous dinner on-board. After Dinner, follow Puppet Show on Sun Deck. After breakfast explore some of Bagan’s local markets selling wood carvings, fabrics, longyis and rattan products. We’ll visit a workshop to see the ancient technique of Burmese lacquerware making. Alternatively passengers can hire a horse cart or a bicycle and explore the site on their own or enjoy a splendid early morning Balloon Flight over Bagan (surcharge applied – optional/Operated October through February) . After lunch, we continue downstream to the village of Tan Kyi. We’ll reach the mountaintop by WW2 jeep where stands one of the four stupas that marked the original edges of the city and enjoy a marvelous sunset over the Bagan plains . This morning we sail downstream to Salay, a 7,000 resident village founded in the 13th century with Bagan-era shrines, beautiful 19th century teak monasteries and preserved British colonial buildings. We visit the huge Youqson Kyaung wooden monastery designed as a copy of the Crown Prince House of Mandalay. We then explore then an area of colonial buildings and some interesting Bagan-era monuments such as Payathonzu and the Shinpinsarkyo Paya . We then return to the ship for lunch and enjoy a scenic cruise south to Magwe. Early morning visit Myat Than Lun Paya, a 1929 built pagoda set on a hilltop with a beautiful view of the river. Back to the ship before Lunch. Following, we sail downstream to the charming town of Thayetmyo containing the oldest golf course of Myanmar with a fascinating history. Overnight on board. After breakfast, we visit Thayetmyo, the local market as well as several colonial homes constructed during the British colonization of Burma before returning to the ship for an afternoon of scenic cruising. Cruise all day. Farewell Reception and theme dinner. Overnight near Prome. Once controlled by the Mon tribe during the Bagan Era and then conquered by the Burmese King Alaungpaya in the 1754, Prome boomed along with the Irrawaddy Flotilla Company in the 1890’s and it is now an important trading post. We visit Thayekhittaya (also known as Sri Ksetra, the “Fabulous City” in the Pali language), an ancient Pyu city that ruled in this area between the 5thand the 9th century AD. 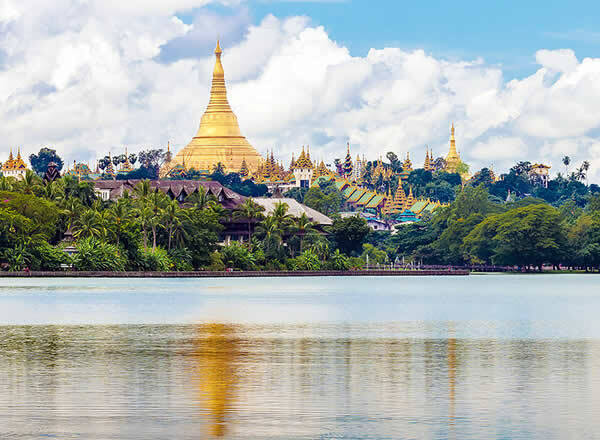 In central Prome we visit the impressive Shwesandaw Pagoda complex, one of the most important Buddhist pilgrimage sites of Myanmar, and the Wunchataung Paya (Apology Mountain Pagoda) a fabulous vantage point of the Shwesandaw Pagoda and the surrounding mountains. In the case of water levels being too high or low an alternative itinerary will be offered to Passenger. Published itineraries are indication only and subject to sudden change. In such events alternative itineraries will be provided and we do our best to ensure that if a stop is missed we make up for it with another stop. The ship’s manager and captain are jointly responsible for passengers’ comfort and safety. Passengers must accept their decisions and instructions. Remark : Cruise operate with Irrawaddy Explorer (RV Paukan 2014) only. All meals &, Coffee/Tea/Water/Local Soft drinks/Local Spirits and Wine (dinner only) – Sightseeing with as described in the Itinerary – Ayravata Cruises English Speaking Guide (additional non-English speaking guide is provided if more than 8 cabins are booked by parties speaking the same language) – All Entrance Fees – Transfer by coach to/from Prome – In room breakfast (Mandalay Suite) – Welcome & Farewell Reception, Cultural performances and other activities on board. 2014 (i.e. USD 0.9 per litter). Should the fuel price rise by more than 10%, AYRAVATA CRUISES will be entitled to impose a fuel surcharge equivalent to the amount by which the fuel price exceeds the price allowed for in the above rates, provided that the notice of this rise is given to the Passenger and/or his-her Agent within 30 days prior the cruise departure date.